Central Wildcat Open: Catholic won three championships and nipped Live Oak by seven points in the heavily Baton Rouge-area-schools laden event. Those results are probably a little skewed though, as Brusly only entered six wrestlers. That group did not include Kendon Kayser or Jo'Vonte Wheeler, who placed first and second respectively at the Warrior Open. Placing third with nine wrestlers but four champions were Bill Bofinger's Baton Rouge Bulldogs. 120 Pounds: Live Oak's Colt Olinde bested Brusly's Austin Franklin via a fall in 1:20 a week after losing to the sophomore Panther 7-3 in the 120 pounds semifinals of the Warrior Open. Olinde's win, however, was in the semifinals. In the finals Olinde faced Raymond Bushnell, who in a mere two weeks has demonstrated that statewide he may be the one to beat at 120 pounds. In the semifinals he sidetracked the return of Denham Springs' Chris Marson 5-2², after which the senior two-time Division III state champion got the better of Olinde by a 6-3 finals score and was voted the tournament's Outstanding Wrestler (photo left). 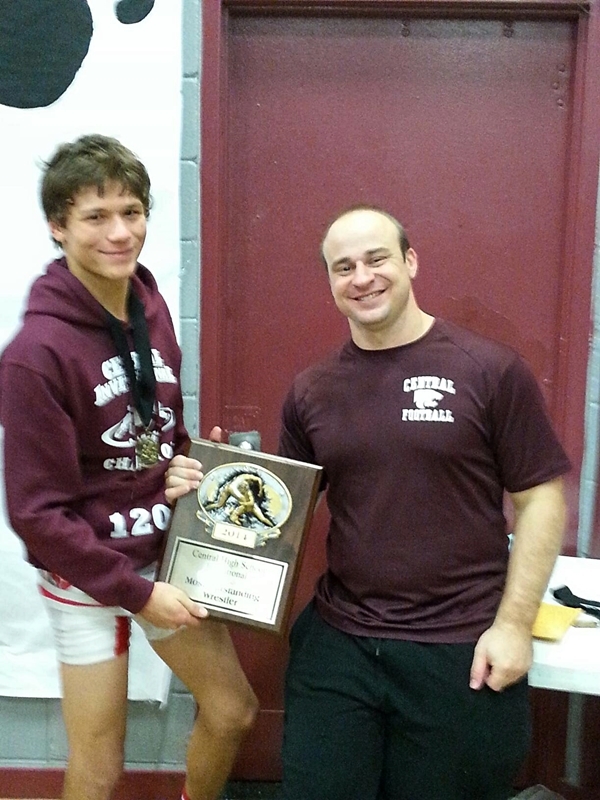 Granted, he has not faced Holy Cross' Beau Bush, who won the Mandeville Open in a convincing 10-2 fashion. And it is not known at what weight the defending Division I 120 pound state champion Ben D'Antonio of Jesuit will compete, nor if Brusly's Kayser will drop two weight classes as he did last year. For now, though, Mr. Bushnell reigns supreme in that weight class. He can solidify that spot at the Spartan Open later this month, which should include Brother Martin, Brusly, Holy Cross, Jesuit and Live Oak. 152 Pounds: Also gaining some payback was Dutchtown's Brandon Cowell, who gained revenge for a 7-4 152 pounds semifinals loss last week to Catholic's returning state champion Matthew Mire with a 5-4 victory in the Wildcat finals. That Mire can be beaten must give hope to the other 152 pounders like Christian Walden of Airline and Jesuit's Mason Griffin. Yet one should not forget George Benoit of Holy Cross who, as Mire did last week at St. Michael, prevailed over Mason in the Mandeville finals (photo left). Nor should one write-off whomever Brother Martin puts in that spot. Mason Williams, last year's 152 pound finalist who lost to Mire by a point, did not compete in Texas last weekend - that spot was ably filled by Kevin Casey, who placed second. Danny Evans, who won at 160 pounds in Texas, could make the drop to 152 if Williams goes 145 (Williams is listed on TrackWrestling at 152, but nobody seems to know exactly what those weights mean). Brother Martin line-up: Brother Martin may have "tipped its hand" early a little in Texas as far as who will wrestle in which weight classes, but they have little reason to worry about doing that - other teams can make adjustments. Steven Shields is currently at 113 and unless he runs into trouble at the Spartan Open or the Trey Culotta, he will have little reason to move down to 106. Currently 106 is ably handled by freshman Luke Cotton, who placed second at Cinco Ranch and had a very good Jazz Town Duals in June. Filling in nicely at the 120 spot is Stephen Rumney, who destroyed his Cinco Ranch competitors, none of whom reached the second period against the junior Crusader. Taylor Gambill already at 126 and Paul Klein is at 132 - there is little reason for either of them to move. Blaine Eisensohn should be comfortable at 138, and that leaves 145 and 152 available for Mason Williams, although Seth Johnson is doing fine at 145 already. Danny Evans should be very strong at 160 and at 170 Kevin Casey, Anthony Schneider, Taylor Soileau and Pierce Williams are all veterans. Yehia Riles is at 182, and with Guy Patron, Jr. dominating 195 so far, there is little reason for Riles to venture that far up, nor for Patron, Jr. to go down - his two tournament wins have consisted of four matches: one 15-0 technical fall and pins in 1:03, 1:53 (photo left) and 0:28. Travis Viener, Jacob Clapp (when he is finished with football) and Matt Montalbano should round out the top three heavier weight classes. Catholic and Dutchtown are scheduled to compete in next week's Griffin Open at Dutchtown High School, so Mire and Cowell may meet for the third time this season. The first really big test for everyone else should be the Spartan Open, though, on November 26th at East Ascension. It should be seeded, but some weight classes may be done so based on last year's results as there simply will not be enough information available to accurately seed it re this season's combatants. After the Spartan, however, and with help from the Trey Culotta in December ("help" only as Catholic and Holy Cross are not scheduled to compete), the seeds will be close to set for the Louisiana Classic. Again, this is purely speculation on the editor's part. Readers may agree or disagree and their comments/corrections are welcome: editor@lawrestlingnews.com. ¹ Yes, I saw the visual grammar lessen all three times! ² The score 7-0 on TrackWrestling was incorrect.